After drawing out a basic sketch of flowers on my canvas, I mixed together equal amounts of acrylic heavy gel and acrylic modeling paste. 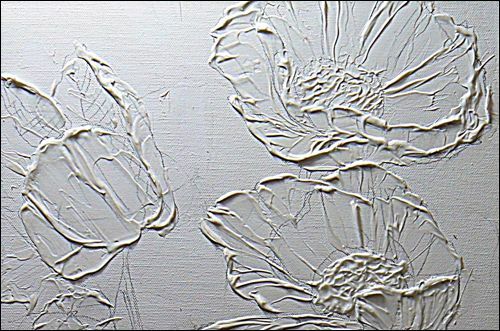 Then, following the lines I’d drawn, I sculpted the petals, flower centers, and leaves with a small palette knife. Painting over the texture: After drying for about two hours my textured flowers were ready to paint.